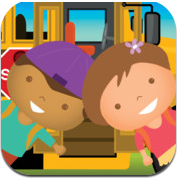 Tiny Drivers: Schoolbus is a fantastic and enticing educational app for kids. This developer also created Tiny Diggers, which you can find on this site in the search box. It’s another example of a family created app. These are typically the best having different ages and parents participating. Tiny Drivers: Schoolbus is presented to us by TouchTilt Games. Learning letters and sounds combined with a big, shiny yellow schoolbus will keep kids coming back for more. There is no need for directions. It’s simply tap and go! Very well designed and the 3 levels in each game are loaded with positive reinforcement! Take The Kids To School!! Tap Away! My inspiration for this game comes from my oldest son, who is in grade one this year, and he’s been very fascinated with school buses (as are many of his friends at school). I think the big, bright yellow, bouncy truck is just so appealing to young kids. Even my 10-month old son loves to watch the school bus go across the screen and pick up kids. I think the best aspect of the game is that kids get to be in control of a big, fun and interactive bus. They get to play the role of the driver and pick up kids to take them to school (which reflects their everyday lives). It’s a fun way to learn about the alphabet and letter sounds. I really enjoy creating interactive, educational games for kids. It’s very satisfying to be ‘in my element,’ having fun, and knowing that kids around the world are enjoying my games. I also love that the making of a game is really an effort of the whole family: not only do I have my older son to play-test the game, but he also gets to star in the trailer (which he thoroughly enjoyed!). Also, I had my lovely wife to do all the voiceover, and just provide me with lots of moral support. I feel very fortunate, and I can’t wait to get started on my next game!